Despite the wintry conditions outside, we are already gearing up for our 2019 field season! We’re excited to be outside in warmer weather again, taking care of the natural areas in our park. If this sounds fun to you, or someone you know, let them know that we’re accepting applications for our 2019 seasonal Land Stewardship Technician crew! We are accepting applications until February 15, and we have up to 3 positions available. See the full job description here. This position is a great way to get some hands-on experience with natural areas management. Technicians will get experience with a variety of techniques for monitoring, invasive species treatment, installing native plantings, data management, and species ID. The position will be up to 20 weeks this year. 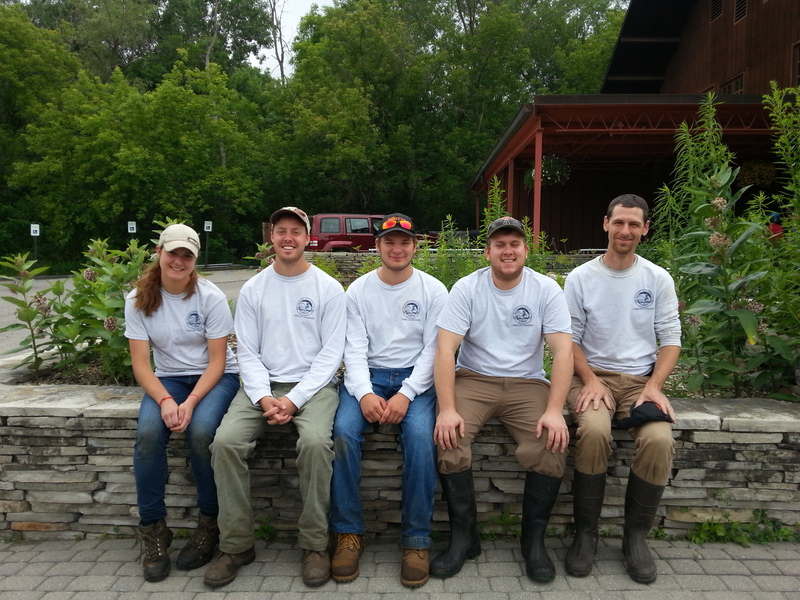 After working for Oakland Township Parks our stewardship technicians have gone on to other natural resources positions, many of them full-time. Anticipated start date is mid-April to early May, but somewhat flexible. Position would end on or before September 28, 2019. Typically work 40 hours/week Monday to Friday, with occasional weekends or evenings for special events. Email: bvanderweide@oaklandtownship.org, with “Seasonal Land Stewardship Technician Application” in the subject line. Cover letter, resume, and professional references must be received no later than February 15, 2019. For more information visit the Parks and Recreation page of the Oakland Township website, www.oaklandtownship.org, or contact Ben VanderWeide, Natural Areas Stewardship Manager, Oakland Township Parks and Recreation, at bvanderweide@oaklandtownship.org, 248-651-7810 ext 401. Want to learn ecological restoration? Check out our job opportunities! Do you love being outside, doing ecological restoration work? We are currently looking to fill some Natural Areas Stewardship positions here at Oakland Township Parks. Applications are due February 19, 2016, so don’t delay if you’re interested! Please share this opportunity if you know qualified individuals. The Stewardship Technician position is a 12 week seasonal, hourly position to be employed by the Parks and Recreation Commission (May to August). Duties include the management of the Township parks’ natural areas under the direction of the Natural Areas Stewardship Manager. Work tasks may include species monitoring, invasive species control, prescribed burning, and assisting with volunteer stewardship workdays. This position will require cooperation with PRC staff, partner organizations, volunteers, and the general public. This position may be ideal for a candidate seeking an academic internship, experience in the natural resource management field, or continued education in stewardship and land management. It is the responsibility of the Stewardship Technician to make any and all arrangements with an accredited institution if an internship is desired. The second position is a permanent, 24 hours per week position (year-round). The Stewardship Specialist will provide technical expertise and coordinate staff and volunteers to effectively conduct ecological stewardship activities in Oakland Township parks. Duties include management of park natural areas under the direction of the Natural Areas Stewardship Manager. Must be familiar with current conservation issues and have knowledge of general biological and ecological principles as they relate to natural areas management; able to identify Great Lakes region plant and animal species; able to operate GPS units and interpret maps; skill in field data collection and management; able to use and maintain power tools and hand tools safely; able to operate tractors and other equipment safely; possess an ability to perform physical work in harsh conditions and inclement weather; and able to work under minimal supervision. This position will require cooperation with PRC staff, partner organizations, volunteers, and the general public.